WASHINGTON -- The political world may have to wait yet another "few weeks" to learn whether one of the biggest names in Democratic politics is running for president. 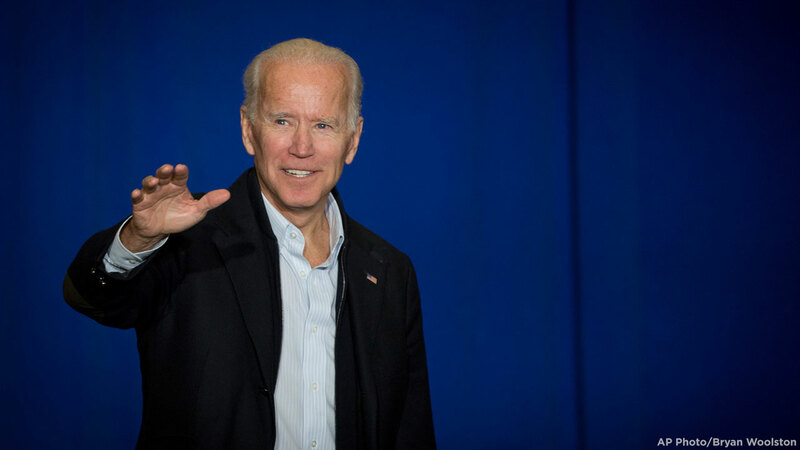 With frustration mounting about his indecision, former Vice President Joe Biden on Tuesday teased out themes for a possible presidential candidacy and railed against President Donald Trump as he faced a cheering crowd of firefighters gathered in Washington. After they chanted, "Run, Joe, run!" the 76-year-old Democrat told them to save their energy because "I may need it in a few weeks." "Be careful what you wish for," Biden added. And with that, the Democratic presidential primary is effectively in a state of suspended animation. More than a dozen Democrats have already launched formal 2020 presidential campaigns. Biden, who is his party's best-known and best-connected presidential prospect, is not among them. Neither is former Texas Rep. Beto O'Rourke, another Democratic heavyweight who plans to visit Iowa this weekend in the strongest sign yet that he may soon join the 2020 Democratic field. In a new ad running on social media Tuesday, O'Rourke indicated he's already "made a decision about how I think we can best continue the work we started" and encouraged supporters to sign up for campaign updates. But until both men make their decisions public, many prospective staffers, donors, and activists are in limbo waiting for the biggest remaining questions about the 2020 field to be answered. Biden's delay, in particular, has frustrated some Democratic officials - and even some of his own advisers, who expected him to declare his intentions in January. His team has been working to line up support with prospective staff on the ground in early primary states and former colleagues on Capitol Hill should he decide to run. Not knowing for sure what he'll decide, Biden's associates have made no formal job offers or outlined a timeline for his decision for potential allies as they work to lay the groundwork for a 2020 campaign. As of Tuesday afternoon, his advisers had not yet gotten a greenlight from Biden that he's in, but they expected a decision was days away. As they wait, some are losing patience. New Hampshire state Rep. Wendy Thomas said she "adores Joe" and has known him for years. But she doesn't think Biden running for president would be the right move. "I love him. I think he needs to step aside, and we need to get a younger perspective and youthful energy," Thomas said in a recent interview. Yet there was new evidence on Tuesday that at least one major group of working-class voters was willing to wait. The International Association of Fire Fighters is "all in" for Biden should he run, said the union's general president, Harold A. Schaitberger. Biden has working-class credibility and hails from Scranton, Pennsylvania. But there's an open question as to how much he could win back blue-collar voters who abandoned the Democratic Party for Trump, particularly in the upper Midwest. Schaitberger acknowledged that many of his union members voted for Trump in 2016. But he argued that Biden is better positioned to win in the Midwest than other Democrats in the primary. "You win the presidency with an electoral (college) victory," Schaitberger said. "It doesn't matter if you get 6 million more votes in California, and 2 million more votes in New Jersey, and a million and a half more in Massachusetts." Biden's speech, which lasted about 30 minutes, was directed toward working-class voters as he presented a vision of America that he repeatedly contrasted with the politics - and president - of the moment. "We can't be divided by race, religion, by tribe. We're defined by those enduring principles in the Constitution, even though we don't necessarily all know them," Biden said. "In America, everybody gets a shot." Repeatedly, though, he tore into Republicans - and Trump - as supporting policies that favor the wealthy to the detriment of the middle and working classes. And he criticized Trump, who he said didn't understand the country's founding ideals "at all." Frequently, Biden returned to themes that were geared toward the working-class voters whom he has criticized Democrats for ignoring. "I'm a union guy. Labor makes a gigantic difference," he said, questioning those who opposed collective bargaining rights by asking: "Who the hell are these guys?" He singled out the Republican-championed tax cut signed into law by Trump, arguing that Republicans want to pay for it with devastating cuts to the social safety net. "I'll never understand people who fight you on the basics, like safety, fair play, health care," Biden said. While he may be popular among working-class men, it's unclear how well Biden would be received by the energized coalition of women and minorities that helped send the most diverse class in history to Congress in last fall's midterm elections. Toni Van Pelt, the president of the National Organization for Women, said Democrats should nominate a woman to go up against Trump in 2020. Biden may have "grown into becoming a feminist," she said, but "he was raised with the privilege of being a white man." "There will probably be a group of people who feel only an old white man may be capable of running the country," Van Pelt said. "I don't believe it."